I’ve used mirrors on all my bikes for many years and really am lost without the “extra eye” that those mirrors provide. Nothing beats a shoulder check in tricky situations, but a mirror provides that “extra eye” for most of the time. Now I know that lots of cyclists consider themselves “much too cool” to sport a mirror on their handlebars, but really, why not use such a valuable safety enhancement? The amount of times that a mirror has literally saved me from too close an encounter with a vehicle is innumerable. On the odd occasion that I have ridden a bike without the benefit of rear vision, I have felt uncomfortable and find myself glancing behind way too much instead of paying attention to the road and traffic ahead. Whereas a quick glance in a mirror is much easier to perform without loss of the view forward. I find a mirror most useful in keeping an eye on traffic behind me when I am crossing an off-ramp or an on-ramp on a highway; when riding a road with a rough shoulder, I can move into the centre of the road when the traffic is clear from behind and move back to my shoulder lane as traffic approaches. Or, preparing for a left turn across traffic lanes, I can see the upcoming gaps in the approaching traffic – then a quick shoulder check is all that is needed before moving out. On one occasion while riding in New Zealand – I narrowly escaped being hit by a wide load – a house being moved on a narrow road with no pilot car! I vacated to the ditch rather speedily when I spied the behemoth in my rear view mirror. Wide loads in general are easily spotted from a mirror and there are many locales that do not require a wide load to have a pilot car in front of the load. Some laws stipulate the pilot car to be behind the load – totally useless to cyclists and pedestrians on the shoulder of roads. After all, it’s supposed to be a “Pilot Car” – wouldn’t a Pilot be in the front ??? To install a decent mirror on my road bike was a challenge though, especially with the integrated brake/shifters (brifters – STI levers) and drop handlebars. There are many mirrors on the market, but the majority of them are either too small or have way too much convex and distort the image. I even tried a helmet mirror, but that took some practice to manoeuvre and every time I took my helmet off, the damn thing would get knocked out of kilter. I did manage to fit a mirror to the end of the drop handlebar and it sufficed, but either my arm seemed to be always in the way, or my knee might hit it at times; generally it was not a easy glance, so it was just not perfect and I missed the clarity and size of the Mirrycle brand of mirrors that I use on all my other bikes. So I ordered one online and a few days later installed it. Very ingenious mounting bracket and super easy to install. Wow, it’s nice to have a decent view rearwards again and no head movements required, just a quick glance. Nice and stable and the lens is the same quality as Mirrycle uses on their other products. Ultimately, I’m very happy with this simple upgrade to my safety and enhancement to my vision. Available from many local bike shops and online from Amazon. 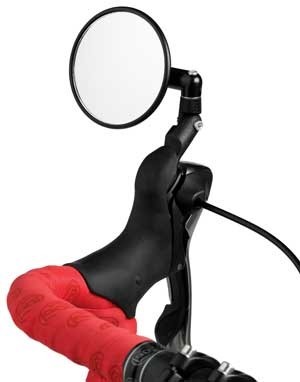 NOTE: This road mirror mount only fits certain models of Shimano brifters – there is a note on the company’s web page explaining which STI levers are incompatible. No affiliation with the company – just a happy customer! This entry was posted in Accessories, Reviews and tagged Mirror, Review, Road Bike on June 25, 2014 by AdamK's Cycling & Travel.